A woman has lost her leg after being seriously injured in a crash outside a primary school. The 62-year-old was removing items from the boot of her parked car when she was hit from behind by a Vauxhall Astra, trapping her between the two vehicles. 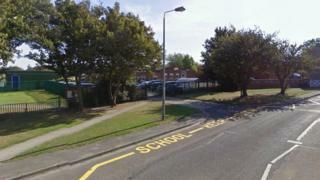 The collision happened outside Burstwick Primary School on Main Street at about 11:45 BST on Thursday. Humberside Police said she had lost one leg and had serious injuries to the other. She is being treated in hospital for life-threatening injuries and her condition is described as stable, the force added. The 19-year-old male driver of the Vauxhall Astra was unhurt.